For each product, the store admin can limit no. of image & text elements a customer can add. Dynamic pricing option lets admin easily assign prices to design elements in ranges. Option to add “Design Ideas / templates” for each product. The customer select idea and apply on product with a single click. Admin can assign each customization option costs separately from the back end. You can set custom fee for Images, Price for Tags, Price for Text and Price for Numbers. Latest update also includes dynamic pricing option. Admin use a range for assigning prices to design elements i.e. You can add images of multiple sides of a product and let customers design each side. Each side have its own layers. For example for Mugs you can enable design options for both side. Each side can have different layers containing text, color & image gallery and you can charge the customization fee for each layer side separately. This Prestashop Customization module provides an excellent way to increase your store revenues without putting any considerable efforts. Allow customers can make desired changes to products and the price calculator tells them the total price of the customization. Instead of paying this amount to some other vendor they can pay it to you and get their desired product in the first delivery. 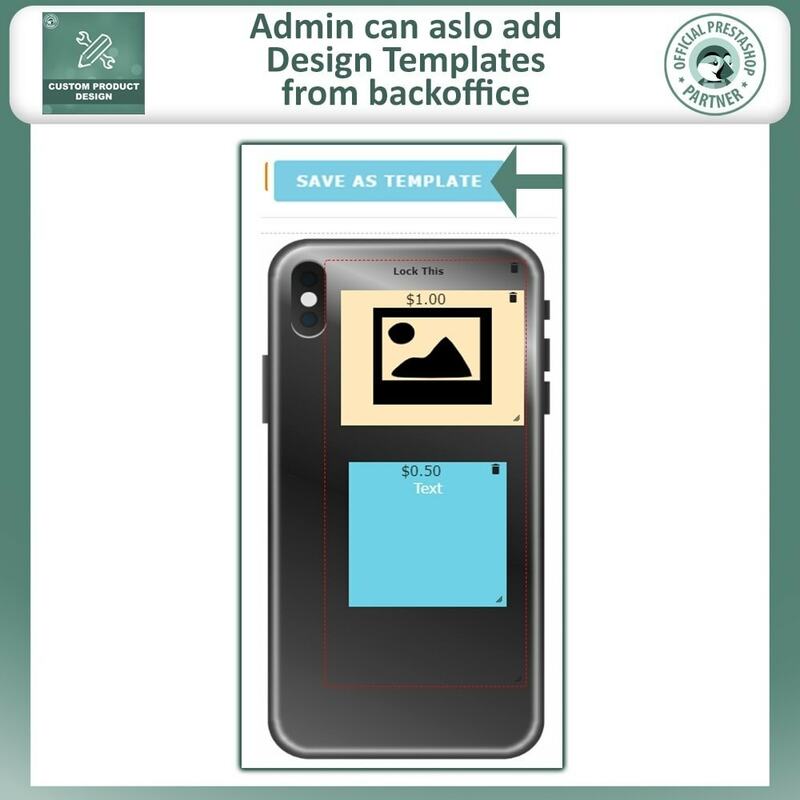 The back office allows configuration settings for font style, color and size, default images, image positions, taglines, character limits and pricing. These settings will appear on the front end of your online store through which customers can make changes on product designs. You can add images of multiple sides of a product and let customers design each side. Each side will be displayed as a tab on design panel. The customer can view different tabs /sides and design them accordingly. Forexample for Mugs you can enable design options for both side. Each side can have different text, color & image gallery and you can charge the customization fee for each side separately. Another example here is a T-shirt where store admin can add 4 different sides like Front, Back, Right Arm, Left Arm. Each side can have its own text, image / clip art gallery. The store admin can set different customization fee structure for each side. Following are some configuration options for these dynamic tabs/sides. You can easily reorder/reposition design tabs by dragging them. You can add unlimited design tabs from Product detail page under “Custom Product Design” tab. You can add unlimited movable and re-sizable image tags for a design tab. You can set price and title for each image tag individually. You can add unlimited movable and re-sizable text tags for a design tab. You can set price and title for each text tag individually. You can enable/disable customization on a product. You can select specific fonts, colors, images/clip art and print material for a product individually. 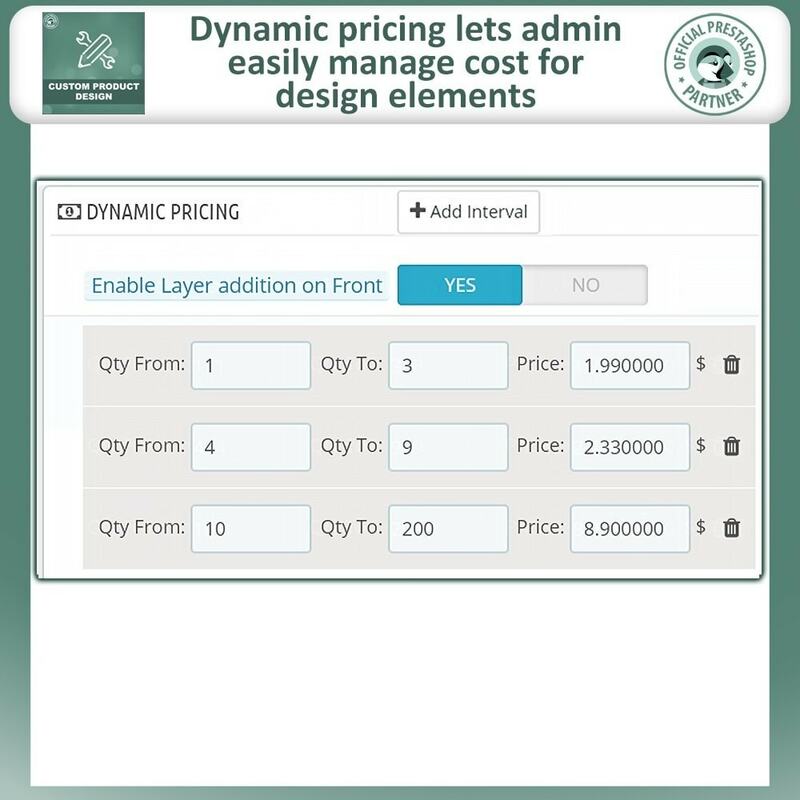 Instead of assigning cost to each design element separately you can also use dynamic pricing option. Dynamic pricing option enables you to assign a price according to the range of the design elements. i.e. 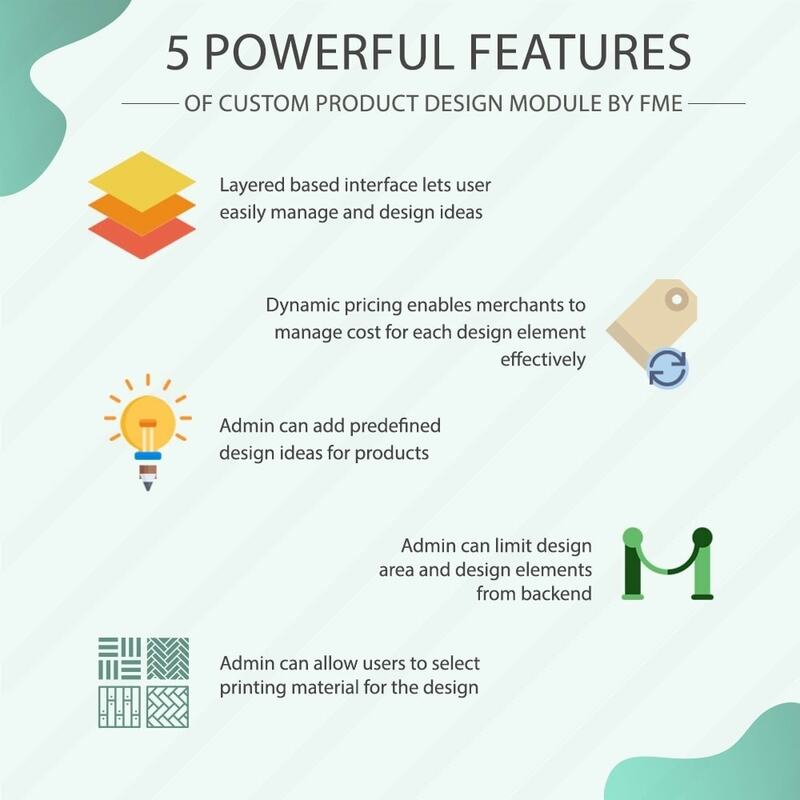 If user adds up to 3 design elements the price will be $2 each and for 3 – 6 design elements the admin can assign price for each element as $3. You can add multiple price intervals. - You can add multiple printing material options for a product. Forexample, for Banners you can addVinyle, Poly & Canvas and let customer choose material on which the banner should be printed. Another example is name /designation plates where you can add material options for customers like metal, wood, etc. The store admin can download the customization order file in print ready JPG/JPEG format. Set custom watermark text color. Set custom font size for watermark text. If a product has variants (color, size), customers can select variants from design page. Each design element added by the user will have its own separate layer. The price for each of these elements is mentioned on the layer. User can easily add and delete layers. Each side of the product has their own set of layers. 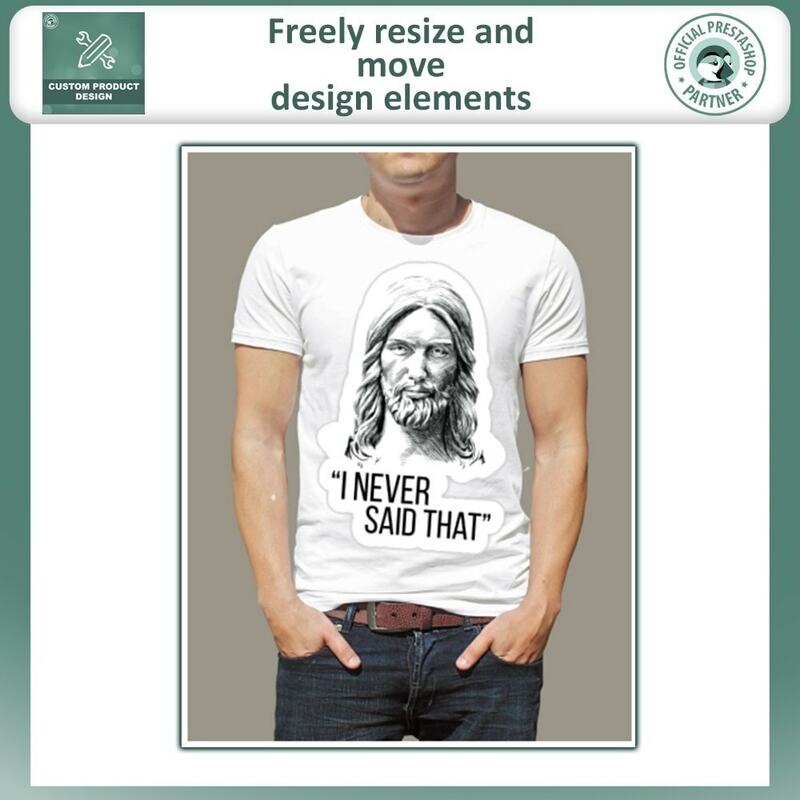 You can add predefined designs for each product. User will be able to deploy these designs with single click. Enable/disable PDF generation option for a specific product. If PDF generation is enabled customers can download their designs in a PDF file. Set PDF orientation either vertically or horizontally. Fonts can be selected from a preloaded fonts list. Drag & drop the text to change its position. Customers can adjust transparency or text/image tags as their per need. To set transparency first select a tag, click Tools tab and adjust transparency by dragging transparency slider. 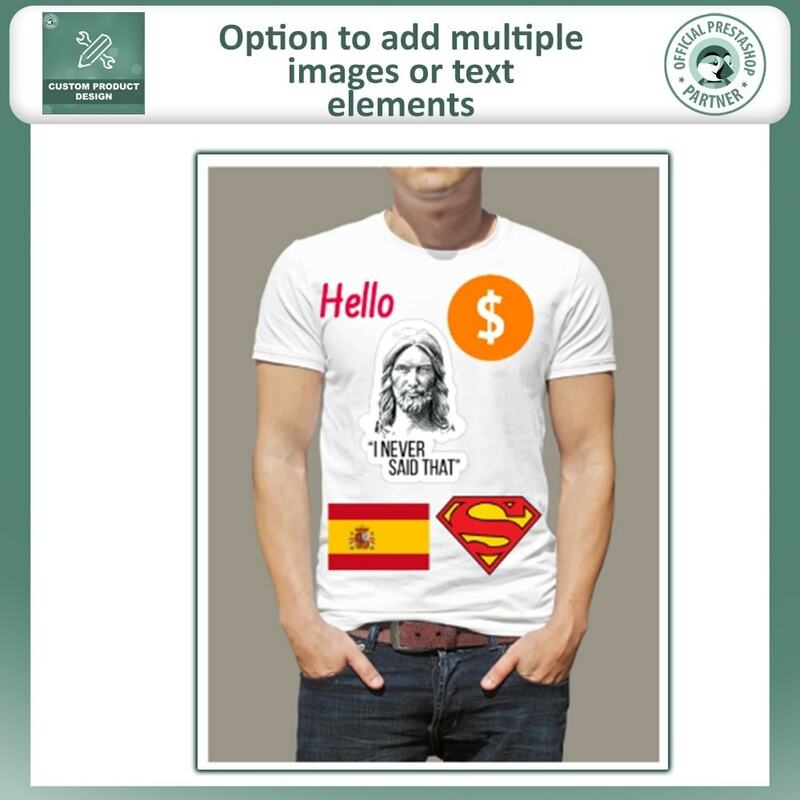 The customer can also change the rotation of text and image. 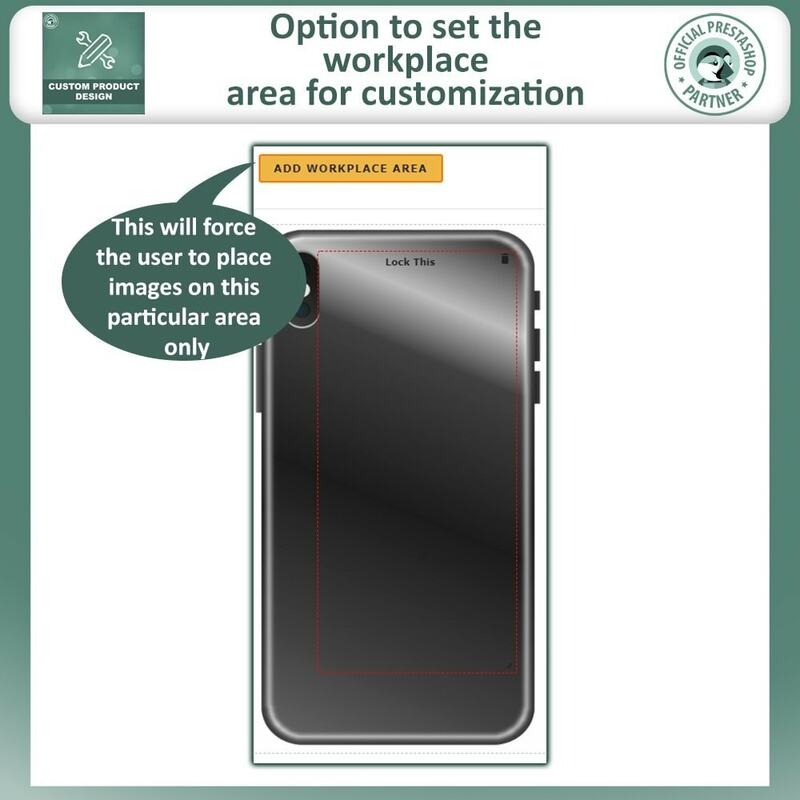 If the print material options are provided for a specific product by admin, the customers will be able to select / change the printing material as per his needs. 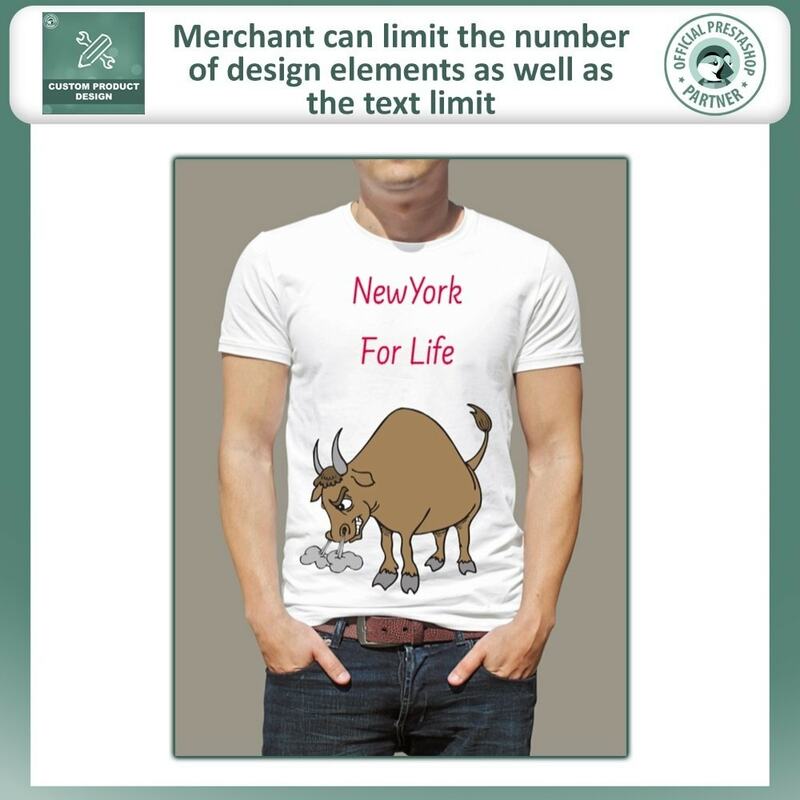 Customers can download their custom designs in a PDF file. 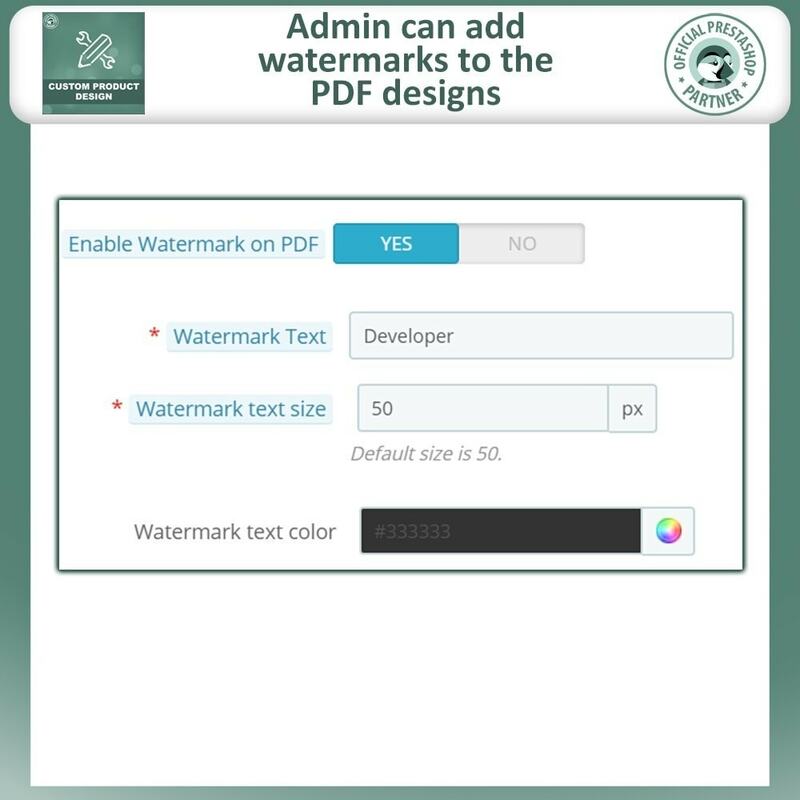 Admin can add watermark to PDF file. 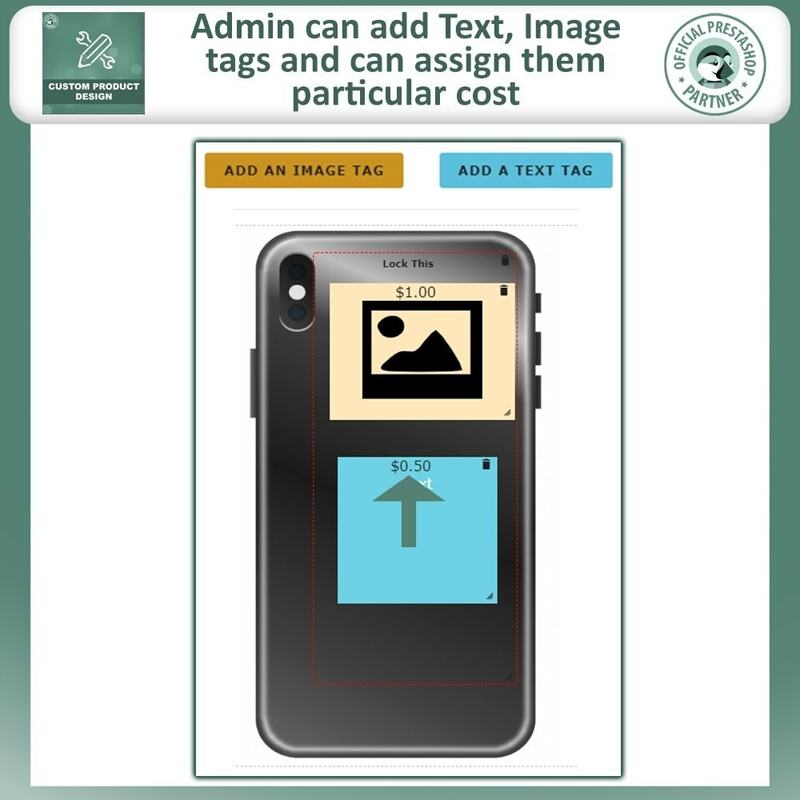 Customers can delete unwanted text/image tags to adjust their design as their per need. Customers can drag/move a text/image tag to adjust their design as their per need. Originally I had a few issues with this product but the developer was very quick in helping me overcome these issues. I would highly recommend this product. This product was great easy to install, however on the front end the pop up tool is a bit constricted for space and in the way when trying to build a design.